We have been waiting FAR too long to have our first wedding with Ulmer Studios but we couldn’t be happier that it was with such great clients like Linda + Matt. I loved so many things about their romantic garden wedding – the succulents, the soft shades of blue, seafoam green and peach, the vintage details… But most of all, I loved the bride’s DRESS! When she showed me a picture during planning, I gasped out loud and couldn’t wait to see it in person! 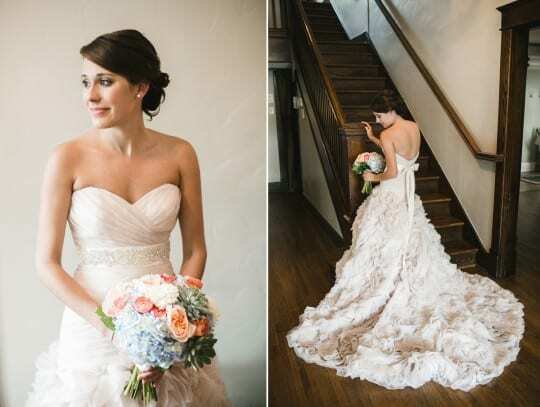 It is a blush Allure gown and Linda purchased it at The White Room in Lebanon, TN. Josh and Amber’s images are just stunning, and this is far from all of them, so make sure you visit their blog. What a great day!